Stuck in Beijing for Golden Week? Here's Where and What to Eat! You are at:Home»Things to Do»Dining»Stuck in Beijing for Golden Week? Here’s Where and What to Eat! Stuck in Beijing for Golden Week? Here’s Where and What to Eat! Stuck in Beijing for Golden Week and starting to feel a bit, well, less than golden? Sounds like it’s time to eat your feelings! Luckily, the majority of Beijing’s fine dining establishments will be open throughout the holiday and some are even putting on special deals for those of us not lucky enough to be jetting off to greener pastures. These are a few of the best options. Find out what the hype around Beijing’s hottest burger joint Royal Stacks is all about this Saturday and grab one of 1,000 free burgers while you’re at it! Free burgers from 11am, grand opening ceremony at 2pm. Former Xinjiang restaurant Red Rose has been transformed into a trendy new gastropub. 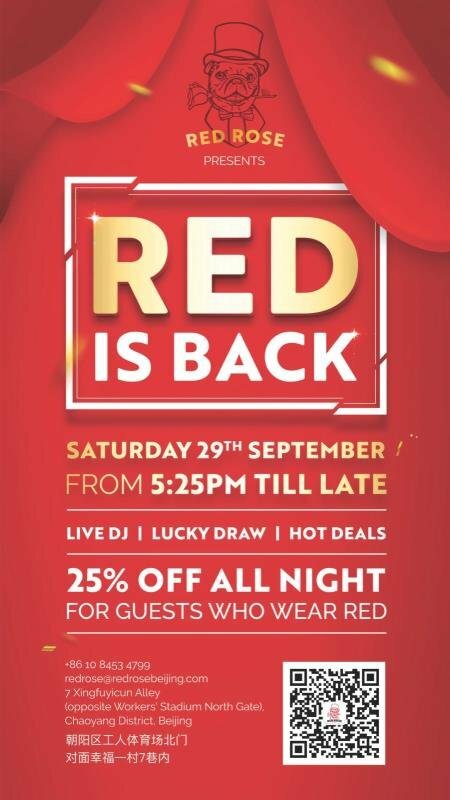 From 5.25pm on Sat, they will be offering 25 percent off for anyone wearing red, as well as other great deals and lucky draws. On Sunday evening, Parwaaz Spice Route Concepts presents a traditional South Indian meal served on a banana leaf, hosted at The Orchid Lodge on Baochao Hutong. Dinner priced at RMB 275 per person, register and pay in advance via Yoopay. Every Wednesday, head to the courtyard at Bistrot B to enjoy three hours of free-flow drinks alongside canapés and charcuterie made in-house by chef Jarrod Verbiak (pictured in lead blog image). Drinks include four cocktails and four wines. RMB 350 per person. 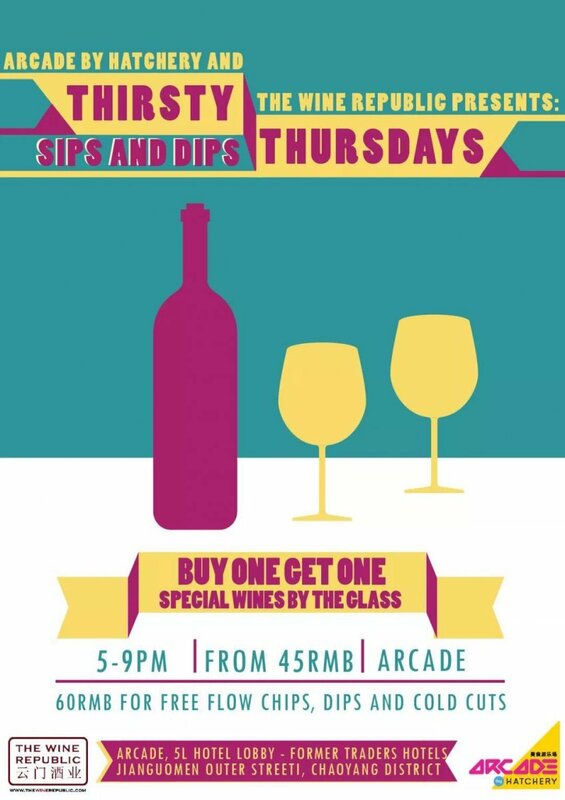 Choose from a selection of wines starting from RMB 45 per glass and RMB 147 per bottle, with glasses buy-one-get-one-free from 5-9pm and bottles at 30 percent off. At Tribe Sanlitun, all dishes and drinks are buy-one-get-one-free from Oct 1-7. Tribe is a good option for visiting guests with food allergies, as all the dishes are clearly marked with what ingredients they contain. Leaving town? Here are seven great things to do in Shanghai this week or check out our tips on how to have an Instagram-worthy trip to HK. Caravan’s popular shakshuka brunch is available every day during the holiday. Customize your shakshuka with toppings like spicy merguez sausages or feta cheese and then pair with bottomless drinks like mimosas and bloody pirates. Jing Yaa Tang’s dim sum remains one of the best deals in town. For just RMB 168 you can order unlimited dim sum and add free-flow Chandon sparkling wine for an extra RMB 168. If you’re looking for a brunch to soak up some of that inevitable holiday boozing, look no further than Arrow Factory. Their hearty British menu is perfect for a late breakfast or a late lunch, depending on what time you get up. They will also have deals on Mimosas, Aperol spritz and more for RMB 35 per glass. These are only a small fraction of Beijing’s many dining events happening this week. For more, click here.